If you like to eat fried food but without using lots of oil then you will have to find out some device that can fry your food oil-less. Today various companies are manufacturing different types of air fryers to meet the demand of people like you. OMORC has introduced one such Air Fryer which can be used flexibly not only for frying with a lesser amount of oil but also for cooking healthier foods by avoiding the use of oil as much as possible. The review of OMORC Air Fryer provided in this write-up will help you to know about it more precisely. OMORC Air Fryer is provided with a button guard and a cool-to-touch handle to avoid the risk of its unintentional detachment. The fry pot and fry basket of this Air Fryer are made of non-stick materials so that it can be cleaned easily after every use or whenever required. All of its removable parts can be cleaned in the dishwasher. It includes 7 preset cooking modes including rib, fries, cake, shrimp, fish, chicken and steak which can cover almost all of your cooking requirements. The recipe book provided with this Air Fryer can help you in baking, frying, roasting and grilling your favorite dishes in almost 100 different ways. Its 7 presets cooking options allow you to use it very easily according to the type of coking you want to do. It preserves the heat to cook your food with lesser or negligible oil which reduces the consumption of energy also. By using its heat preservation button you can keep your food warm for a considerable time. Oil-free cooking: OMORC Air Fryer cooks your food with no or very little oil just by using air circulation technology for circulating the hot air around the food to be cooked from all directions. It provides you the nutritious and healthier food every time just by cooking it evenly from all the sides and at a faster speed. The 7 preset options to cook food provided in this air fryer allow you to cook the food of your choice as you wish as you can select the cooking mode as per your choice. You can cook rib, fries, cake, chicken, shrimp, fish and steak just by putting your prepared food in its fry basket and selecting the time and temperatures, as directed in the recipe book provided with it. You can leave the rest on this air fryer as it will cook it with minimum oil and at a faster pace. The temperature and timer settings of this air fryer can be controlled easily with a push button and a sensitive LCD touch screen. You can easily operate this air fryer just by pushing its button to start and adjusting its button by rotating it. It can keep your cooked food warm up to 120 minutes just by using its Heat Preservation button. The removable parts of this air fryer like fry pot and fry basket are made of BPA free and non-stick materials to make the easy to clean every time. It is safe to use as its button guard and cool-to-touch handle can avoid unexpected detachment of its frying basket or pot. Al its removable parts are dishwasher safe to clean it easily. OMORC air fryer is 100% safe to cook any food as it stops cooking automatically when its fry pot or fry basket is taken out of it. It resumes cooking process as soon as the pot or basket is replaced in it. 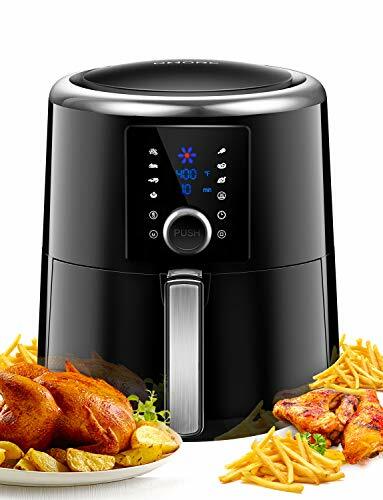 In order to prolong the life of this air fryer and avoid injury, there is an inner fan that disperses the heat around the food to cook it evenly from all the sides and cools down the food after cooking it. After going through the review of OMORC Air Fryer provided in this write-up it can be concluded easily that this device stands out in the mob of various types of air fryers from different brands available in the market due to its larger size and air circulation technique to fry the huge chunk of food evenly without using much or any oil.